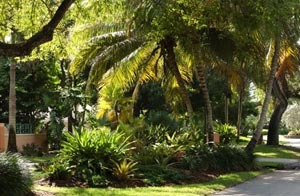 Landscape Genie of South Florida, LLC. Hi, my name is Jose, and I am the Owner of the Landscape Genie of Fort Lauderdale. No doubt you have seen our trailers and some of our exceptional lawn service work while driving through your neighborhood. When you call for a quote, you'll be speaking directly to me. Also, it will be me arriving at your home or business, on time, to offer you an estimate. When we show up to mow the lawn, I am one of the guys directing the work. Yes, we are a small company but we are Fort Lauderdale's premier lawn maintenance service and we cater to both residential and commercial clients. Based in Middle River Terrace east Fort Lauderdale we pride ourselves in providing our neighbors, world class service that exceeds customer expectations. The Landscape Genie of Fort Lauderdale is owner operated, licensed and insured with all the appropriate licenses for Fort Lauderdale and Broward County. Please navigate our services and see why our customers rave about our lawn and garden services. You can read what they have to say in our Customer References page. So if you are a home owner or business owner in Fort Lauderdale who demands only the best in lawn care, call the professionals - call the Landscape Genie of Fort Lauderdale today!